I ran across the display above while talking about smallmouth fishing with my old friend Bob Nicholson. Bob and I have spent many years fishing for trout on the Muskegon River in Michigan. In the summer when trout fishing slows down, the Muskegon becomes a really great smallmouth fishery. Enquiring about the chart, of course, led to the following story. Looking at the chart I said, “So that is this fly marked ‘Original’ that has gold body and turkey feather wings for claws, barbell eyes and a tail” . “Yes, that was the original pattern but there were problems with it. It had a lot of stuff. I changed the hook to a #3366 because of the bigger gap with a hair wing and a flared head and it fished better. I caught fish with it. Next I diminished the materials and forgot about the claws. I didn’t bother tying a body, just a bare hook. “Well I might have gotten there by a different method. 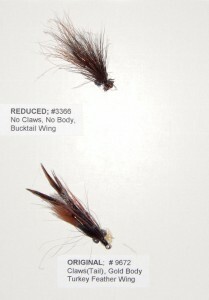 The fly is nothing but natural deer hair, bucktail, dumbell eyes and I laquered the head. That ended up with what I call a basic and it caught as many fish as the more elaborate ties. 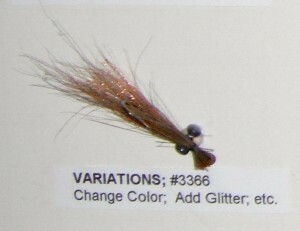 Some changes to the fly were putting a little glitter in it and changing the shade of the fly here and there. Because the crayfish are not all one color. “So, Bob, your middle top one is a “final” fly. Actually I see where you followed something Bob Clouser is supposed to have said which was ‘I kept putting on less and less and the fly got better and better’ “. I thought about the conversation and realized what we have here is another story about the inventive natures of fly fishing, especially as respects the important item at the end of out fly line. This “tale” shows the results of that inventiveness. Bob Clouser developed the concept of a simple fly, the Clouser Minnow, which has a universal appeal to a large number of fish species. 84 fish species have fallen for his minnow design. 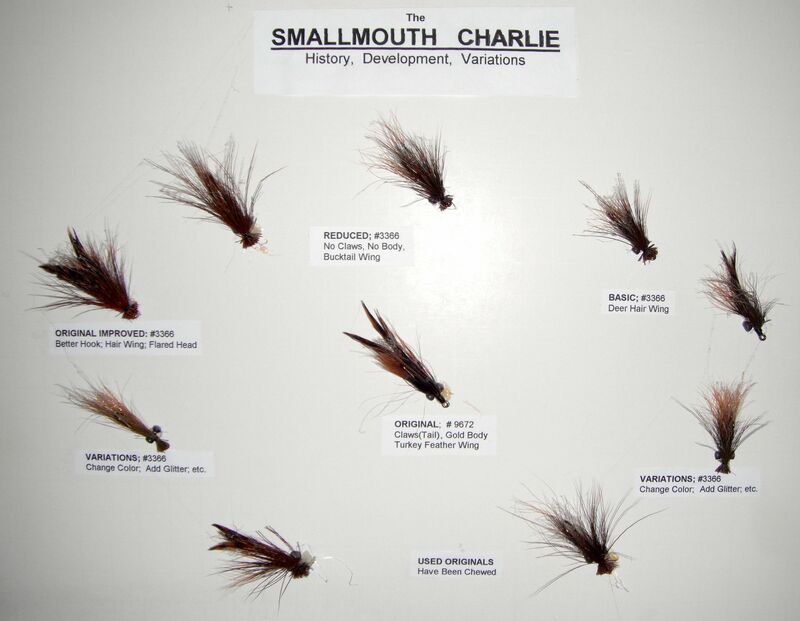 On a regional basis Bob Nicholson took the concept and refined it to work on a local river fishing for one specific fish, the smallmouth, and as a representation of a favorite fish food..
As I studied the fly on the chart above, another thought occurred to me. There was more going on than just simplifying a fly concept. I noticed two other factors in play. One was Bob’s comment on varying the color of the fly which represented different coloration of crayfish in different parts of a river. The second factor is that with less material, only natural deer hair and some flash material, the lesser amount of material allowed light to flicker through the fly better adding color shifts that might simulate movement. In other words the moving fly attracts the eye because the material is sparse. While a bulkier “solid” fly might look less like food, the smaller amount of material might not be what the fish is looking for. I’ll have to try that with some of the other bait imitations.